This product is case packed in quantities of 12 per carton. A break carton fee of $11.00 will be applied to orders that are not placed in case denominations of 12 units. 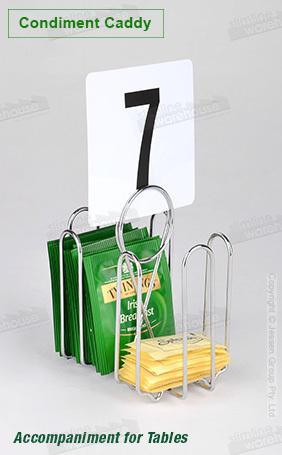 This restaurant caddy, table condiment holder is perfect for holding sugar, teabags, a salt and pepper shaker set, and jam packets. The stand has (2) compartments to hold items to offer a variety to your customers easily. This stand is a key addition to any bar, cafe, restaurant, or coffee house to provide an easy to spot place for condiments. The table condiment holder is made of wire, providing a low-cost display that still provides a durable stand for years to come. Chrome plating provides a stylish look that looks just as at home at an upscale coffee shop as it does at a low-key cafe. Like many of our other hospitality displays, this stand features a number holder that helps employees and customers alike easily identify what table they are sitting at. The coil holder easily grips varying thicknesses of table numbers! Our online catalogue is full of hundreds of items that can be used to promote your goods, services, & merchandise, and is available by clicking here. Slimline Warehouse has been a leading provider of high quality goods for over 20 years, with our low prices unable to be matched anywhere else. Orders placed by 1pm EST will despatch same day to anywhere in Australia, including Sydney, Perth, Melbourne, Adelaide, Gold Coast, & Brisbane!